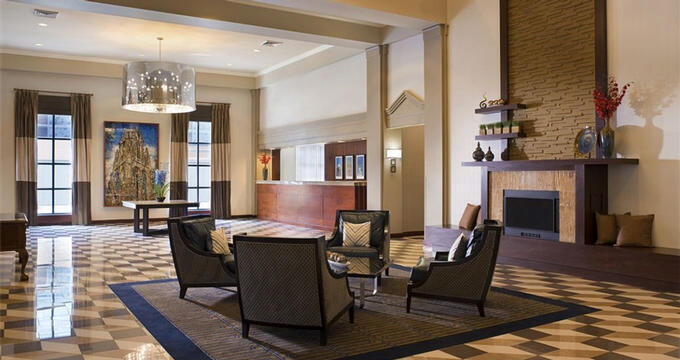 This grand hotel is just a few minutes away from the historic Yale University, the New Haven Hotel in New Haven, Connecticut provides its guests with premium luxuries and high-end hotel amenities. During their stay at the New Haven Hotel, guests can explore the eccentric, historic New Haven, experiencing all its extraordinary views, tastes, and favorite destination sites. King Guestroom – This guestroom is 300sf, with a plush king-size bed, premium bedding, and duvet offering its guests a refreshing night of rest. Guests can unwind at night in front of their 42” HD television while wearing a comfortable robe. Business professionals can get work done on the work desk complete with an ergonomic chair for maximum efficiency. Additional amenities include a gourmet tea and coffee service, iron and ironing board, electronic safe, microwave, and refrigerator. Executive King with Sleeper Sofa – Guests who enjoy a more spacious lodging area can enjoy their 350sf Executive King guestroom. Guests sleep on a super comfortable king-sized bed and an extra sofa sleeper for additional guests. A comfortable chair, 42” HD television, and two-tiered writing desk can also be found in this guestroom. Guests can then retreat to their spa-inspired bath, enjoying bath amenities and experiencing ultimate comfort and relaxation. All other standard room amenities are included in this room. Two Queen Guestroom – This room is 350sf and includes two queen-size beds. Also, guests can enjoy a work desk with an ergonomic chair, complimentary Internet service, and comfortable, plush robes. Guests can also disconnect at the end of the day with a DVD player and 42” HD television. King Suite with Separate Living Room – In the spacious 550sf suite, guests can rest in a king-size bed with deluxe bedding. Other accommodations include a work desk and chair, as well as a living area with a full-size sofa sleeper. The King Suite also includes a fully stocked kitchen, including a refrigerator, sink, and cooktop. It is essential that guests know that the King Suite cannot be reserved online. This suite is known as the ideal location for guests planning to stay long-term. Two Queen Bedded Suite – This suite is the largest offered at the New Haven Hotel with 650sf. This suite has two queen-size beds along with a full-size sofa sleeper option. A full kitchen includes a refrigerator, sink, and cooktop. This suite has a large living and sitting area, premium bath toiletries, and two-tiered work desk. The Lobby and Living Room – The amply built Lobby and Living Room are 2500sf, complete with 20-foot tall ceilings, fireplace, and 40-foot accent wall. This wall extends upward toward the second-floor hotel restaurant. The Lobby offers its guests premium, plush seating options, flat-screen televisions, and a 14-foot long marble communal table with outlets and data ports. This Lobby is the ideal location for guests to finish their work or check e-mails. Business Center – This center is the perfect spot for guests working on projects or work. The Business Center offers its guests Apple and PCs, depending upon their preference. A daily dry-cleaning service is also available to guests, as well as a tea and coffee service. The hotel has a 24-hour on-site fitness center, allowing guests to fit in a quick workout between meetings. Second Floor Restaurant – True to its name, this restaurant is located on the second floor of the New Haven Hotel. The Second Floor Restaurant was recently renovated and updated, providing its guests with an elegant and relaxed dining environment. Guests can indulge their taste buds each morning with the Second Floor Restaurant’s hearty breakfast options. Market – At the Market, guests can browse amongst the wide selection of teas, coffees, and soft drinks offered, as well as sparkling waters and fruit beverages. The Market also includes an impressive variety of desserts and healthy snacks. Its convenient location in the New Haven Hotel’s lobby allows guests to grab a bite to eat or drink while they are on their way out. Wine and Cheese Reception – A distinct and beloved feature of the New Havel Hotel is the Wine & Cheese Reception. The Wine & Cheese Reception offers the New Haven Hotel’s guests the perfect way to unwind after a long day of business, travel or adventure. All cheese and wine are complimentary.